Aventura en la jungla por carretera. 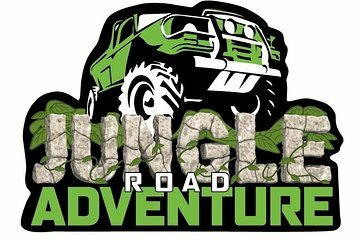 Sumérgete en la densa jungla de México en un poderoso vehículo Jeep en una emocionante excursión de un día completo desde Cancún. Visite una antigua ruina maya en el corazón de la selva tropical; nadar en las refrescantes aguas de un cenote; y vuele sobre las copas de los árboles a alta velocidad en un viaje de tirolesa. Explore la Riviera Maya de la mejor manera posible en este tour de Cancún. Explora un zoológico interactivo y acércate a todos los animales. Salga de una ubicación central de Cancún en su impresionante vehículo Jeep, dirigiéndose directamente al sitio arqueológico atmosférico de El Rey (The King). Llegue al sitio y comience de inmediato a descubrir los misterios mayas de las ruinas con su experto guía. Obtenga información sobre la civilización maya, aprenda sobre la cultura y la historia mientras alimenta a los numerosos habitantes de las iguanas de la zona. Luego dirígete a un zoológico llamado Croco Cun. Aquí, tendrás la oportunidad de ver varios tipos de animales, incluyendo monos, guacamayas, serpientes, venados y, por supuesto, cocodrilos, y aprender información interesante sobre ellos. A continuación, suba a bordo de un ATV de dos personas para conducir en una emocionante pista todo terreno hasta el corazón de la jungla mexicana. Pase paisajes espectaculares y una fauna diversa mientras se aventura a las aguas cristalinas de un cenote. Mire hacia abajo a las profundidades de la piscina de 65 pies (21 metros) y luego sumérjase desde un acantilado escarpado en el agua brillante que se encuentra debajo. Refrésquese en las aguas revitalizantes antes de secarse para experimentar la siguiente parte de la aventura. Ingrese al cenote de forma alternativa con un cable de tirolesa en alza; deslícese a una altura de 10 pies (3 metros) en las profundidades deslumbrantes o atraviese las líneas superiores de los árboles en otro circuito. Una vez que haya satisfecho su apetito por la adrenalina, escuche mientras su guía explica el significado espiritual y ceremonial del cenote en los tiempos mayas. Luego, viaje a las fabulosas instalaciones de un club de playa privado; hundir los dedos de los pies en las arenas de seda de la playa; nadar en las aguas cristalinas de la bahía; o recuéstese en una lujosa tumbona con un cóctel. Pruebe los sabores explosivos de Yucatán durante un delicioso almuerzo, en el que se sirven especialidades locales para su disfrute. We had an amazing time and a big thank you to Kyle who spent the day with us and even had lunch with us. We were in a party of two as another family who booked the same tour had to re-schedule so it was like a private tour. Everything was really well organised. We met Kyle at La Isla shopping mall in Cancun at 8.00am and I was given the keys to drive the jeep around Cancun for the day. The petting zoo was fantastic and the zip wires and quad bikes were great fun. We also really enjoyed swimming in the cenote and getting to do so much in one day was amazing. Kyle was a great host, very informative and made a lot of effort to make sure we enjoyed our day. He even accompanied my partner on the zip wire to help him with the braking system. 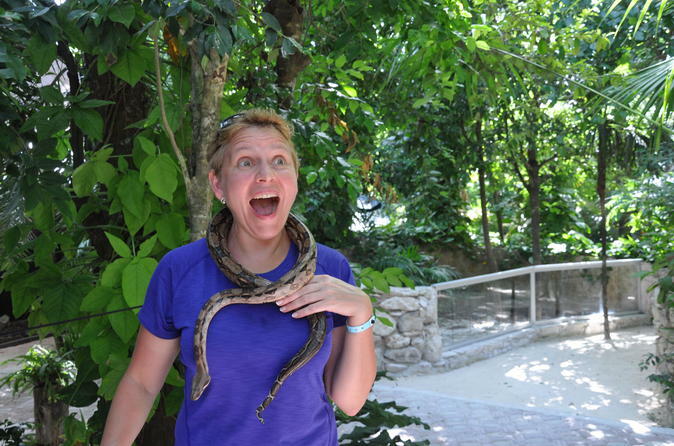 This was the best part of our vacation to Cancun! Our tour guide was amazing!! I wish I remembered his name - it's not that he didn't make an impression, just that it's been a couple months now. He was very knowledgeable about the city and the ruins, he answered all of our many questions and we just simply enjoyed talking to him as we traveled to the next fun activity. The interactive zoo was incredible. I've never been to a zoo that was actually as interactive with the animals as that one. The guide there was also amazing - very friendly and very knowledgeable. We saw a lot of cool animals. The Cenote was a lot of fun! It was beautiful. I never even knew those existed before. We had a lot of fun jumping in to the Cenote. Of course, the ziplining and the ATV-ing was exhilirating! The tour guides there were also incredibly friendly and fun. Overall, this was an amazing, amazing excursion. I was blown away by the friendliness of everyone we met. Every single activity in this package was so much fun. The price was money well-spent. I would highly recommend it!!! Great Combo Tour which had everything - basic Ziplining, ATV, visit to an unspoiled beach with great lunch and the Interactive Zoo where the guide was awesome - unfortunately I do not remember her name. Also my son enjoyed driving the hummer for a part of the trip. The company that runs this tour is truly amazing. We booked through viator the night before we now know it is supposed to be a 48 hour notice and they scrambled to make sure this tour happened for us! Merak truly loves what he does and it shows! Kyle the other tour guide met up with us by the time we got to the interactive zoo and was equally informative. They made sure that we had the best experience we could. No need to worry about missing the perfect photo op, Merak has that covered!We learned so much about about the Mayans! It was truly a culture shock leaving the resort but with Merak and Kyle at our sides it was truly worth it! Shout out to the restaurant: The fish burrito was AWESOME! Ask Merak about his Taco Tour! Best tour! This was amazing. Best time of my life!!!! My 13 and 9 year old daughters really liked our guide Mercet (guessing at the name spelling). He was knowledgeable and likeable. Talking with him was a great way for all of us to learn about another culture. Zipling and ATVs were fun and the swim in the cenote was the perfect way to end the day.